When the talented Janine (Sugarkissed) contacted me to join her (and other cake poppers:)) in a cake pop "Spring has Sprung" event, I was more than happy to comply. Right away I thought of bird nests. When I visited my daughter and family in Texas last month, my grandchildren and I enjoyed watching the birds eat from the bird feeder that my daughter hung from a tree. There was quite a frenzied crowd! I also noticed that there were nests in three of their barren, wintry trees. Springtime is definitely on its way, and I enjoyed seeing the early signs in nature. The nests were all ready, just waiting to house some eggs. 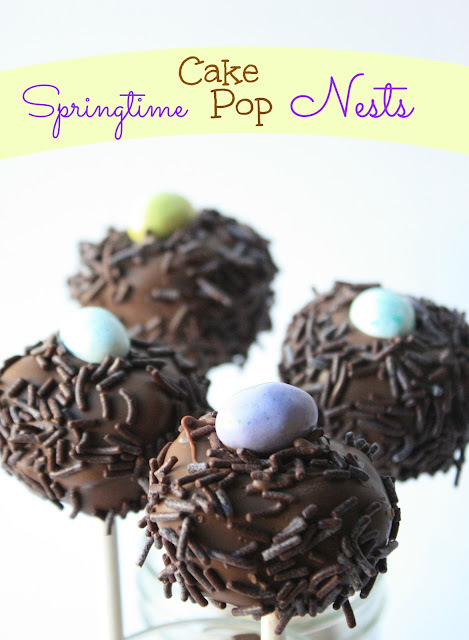 Of course, I'm sure the real nests had deeper pockets for momma bird's precious cargo, but this is my cake pop interpretation:) I hope you see signs of spring where you are too! Add about a half tub of chocolate frosting to the cake crumbs, until it has a workable consistency. Prepare cake balls and place them on a wax paper lined baking sheet. Melt the chocolate, dip the tip of a lollipop stick into it and poke into the middle of each pop, halfway. Place the baking sheet (with the pops) in the freezer for about 15 minutes. Working with a few at a time take from the freezer, indent the top, middle of the pops with your thumb. Dip the pop into the melted chocolate and let the excess drip off. 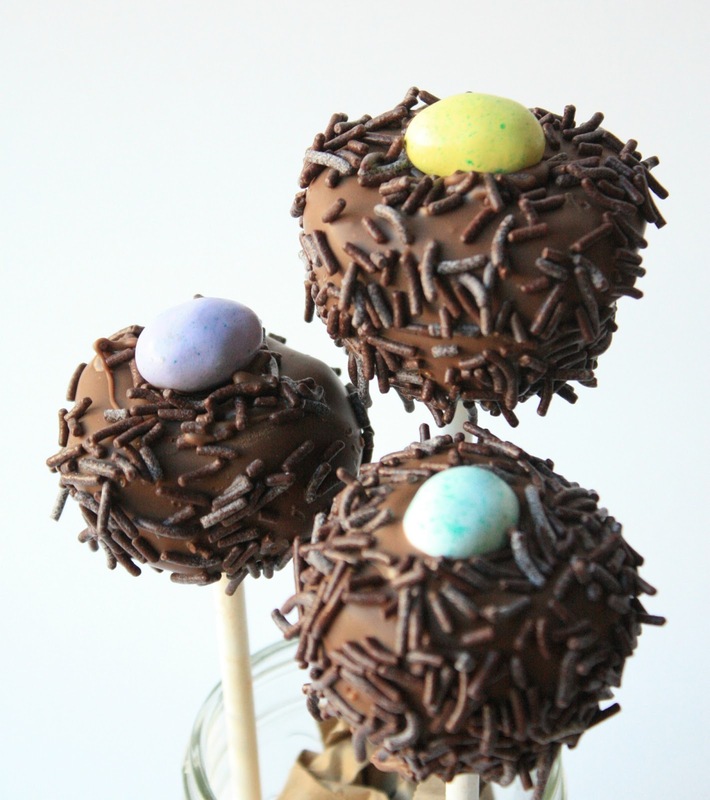 Sprinkle with the chocolate jimmies and press a candy egg into the middle. Poke stick into styrofoam block until cake pops are dry. Thanks Janine for including me in this fun, "Spring has Sprung" event! Be sure and hop around to the other blogs featuring these pops! You can see from the collage how adorable and creative they are! These are so beautiful, yet simple - I love them! These capture the essence of Spring. Plus, you can never go wrong with chocolate sprinkles in my book! love your pops - hope people will make them! Many blessings to you & greetings from Germany. So cute. Now to decide whether to eat the nest first or the egg! I love it ^_^ innocent little chocolate temptations! Sue these are wonderful! So cute for Easter. What a great collection of cake pops. Your wonderful creativity fits right in. What a cute idea but then all of your ideas are cute. I definitely couldn't stop at one. A lot of alternative popped into my head the minute I saw your creative recipe. I could use different colors of chocolate sprinkles or maybe use white chocolate for the dip instead of brown. Thanks for the nifty Easter idea! Fun! And glad to hear you got some time with the munchkins too! ɑgain aand aid otҺers lіke you helped me.